A week-long sports and cultural fest was observed with a lot of fanfare in the Department of English of BGCTUB between March 3 and 10. During the week, Cricket tournament, parliamentary style debate in English and cultural competitions were held. All these events were organised by the university’s Sports Cub, the Debating Club and the Cultural Club respectively. The Sports Club under the supervision of Saiful Islam, Lecturer and Adviser of the Club organised the cricket tournament. In the Cricket Tournament 2nd Semester clinched the Champion’s trophy by beating 3rd Semester. Sushanta Chowdhury from 2nd Semester was adjudged both the man of the match and series. The Department of English organises inter-semester English Debating Competitions each year under the initiative of the Debating Club. This year the event was organised by Mr. Kazi Shahidul Islam, Lecturer of the Department and Advisor of the Club. 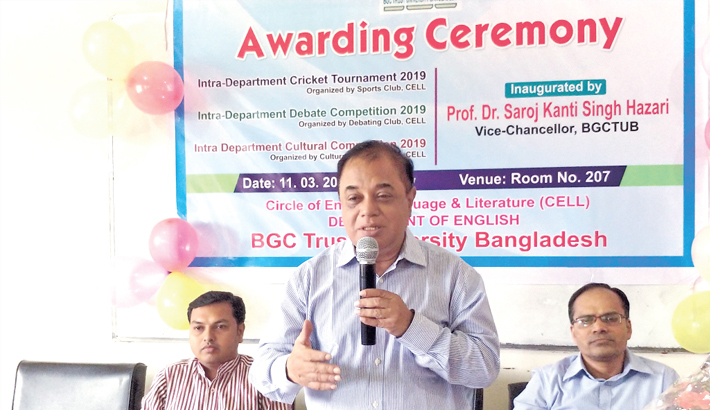 The Debating Club under the Circle of English Language & Literature, a co-curricular organisation of the Department of English, BGC Trust University Bangladesh, organised the finale to its Inter-Department English Debating Competition in the British Parliamentary format on the campus. With the slogan “Through reasoning invincible youth shall surely find out solutions to socio-economic anomalies", the club inaugurated this intra-semester competition on the 3rd of this month holding the first round and semifinal on the knockout basis. All the faculty members and the students attended the audience of the Finale on the motion "Freedom of mass media should be curtailed." between the two super-teams "The Shakespeareans" from the 3rd semester as the Government and "Oggo 23rd" from the 5th semester as the Opposition. However, Maruf Mishal from the Government became the best debater in the finale. Ms. Joysree Das, Asst. Professor of Pharmacy Department and President of the BGCTUB Debating Society, chaired the finale as the speaker while Mohammad Abdul Hannah, Lecturer of Law Department and Ms. Nawrin Afrin, Lecturer of FBA were present as the adjudicators. Mr. MD. Khaled Bin Chowdhury, Associate Professor and Chairman of the Department, who is also the President of CELL, acted as one of two internal adjudicators - the other being Ms. Zinufer Yeasmin, Lecturer of the Department. The Cultural Club under the supervision of Rini Dutta, Lecturer and Adviser of the Cultural Club organised the cultural competitions. The cultural competitions comprised of four events. They were singing, dancing, recitation and impersonating the literary characters. In music, Saima Tayub of 8th Semester snatched the first position. Trayee Chowdhury from 5th Semester begged the top position in dancing. The first position in recitation was won by Afia Rahman from 7th Semester and the top position in Impersonating literary characters was conquered by Sadia Khanam from 3rd Semester. The award giving ceremony was held on March 11. Crests and certificates were awarded to the winners and participants of the competitions. Vice Chancellor Prf. Dr. Saroj Kanti Singh Hazari was the chief guest in the awarding ceremony. The Registrar A.F.M. Aktarujjaman Kaisar was the Special Guest. The programme was presided over by Md Khaled Bin Chowdhury, Head of the Department of English, while Professor Shaswati Das, Mahamuda Akter, Jebun Nahar, Tanzin Sultana, Lecturers of the Department were present among others. Students of the English Department attended both the competitions and awarding ceremony enthusiastically.